Yohannan said these things at a staff meeting held at GFA’s office complex on May 14, 2015. The audio is embedded at the end of the post. When I posted the audio in August, I also posted images of court cases involving Believers’ Church which refer to Yohannan as the managing trustee of Believers’ Church. 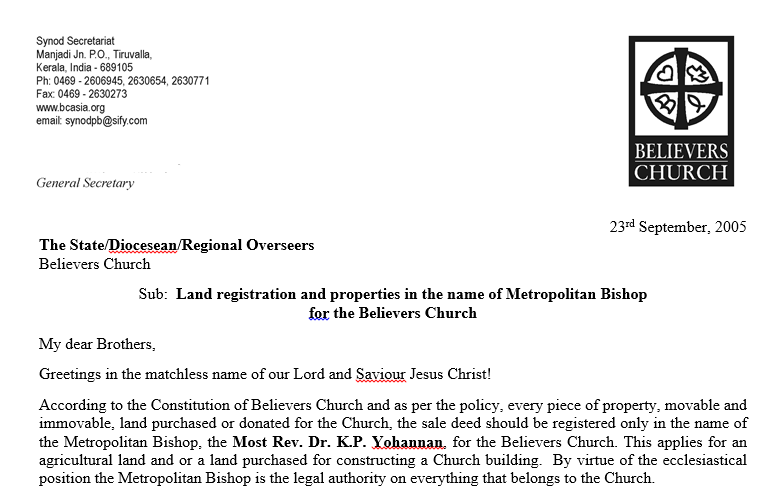 Even though Yohannan said it was a conflict of interest to be on the board in India and the CEO in America, court documents dated in 2015 refer to Yohannan as the managing trustee of the entity (Believers Church) that “decided” in 2013 to send $19.8 million to another entity (Gospel for Asia) run by Yohannan in order to build a new campus. Recently, I have been given two documents which establish beyond doubt that Yohannan’s statement to staff was misleading. 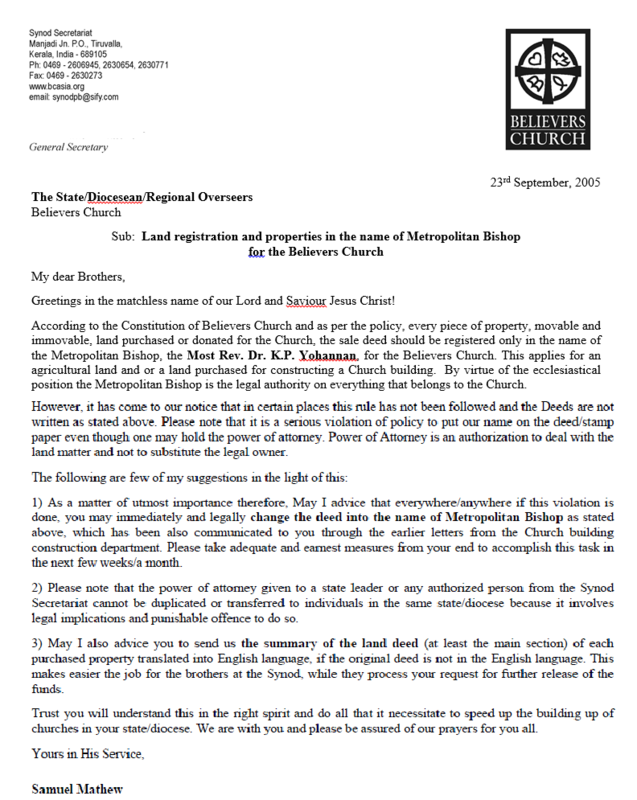 The first document is a 2005 letter from BC Bishop Samuel Mathew to all Believers’ Church Bishops regarding the proper way to file land deeds. The church Constitution requires all land to be in K.P. 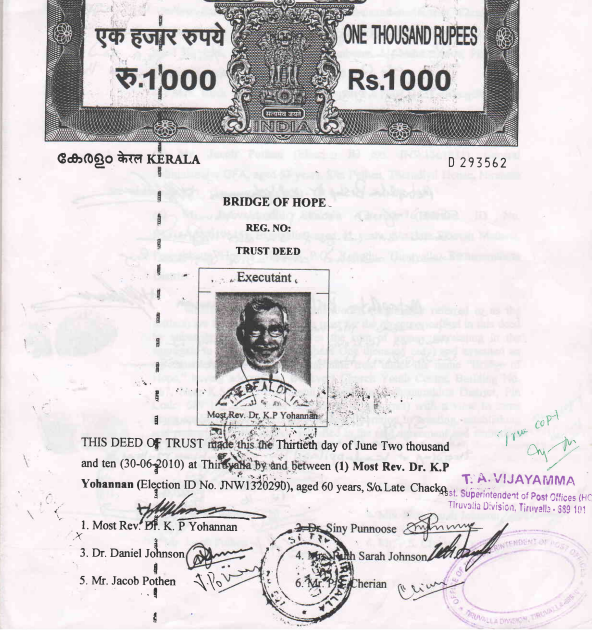 Yohannan’s name since he is the highest legal authority in the church. At this time, by Consitution, all land was to be registered to “the Most Rev. Dr. K.P. Yohannan.” Why? As Metropolitan Bishop is the legal authority on everything that belongs to the Church. Presumably, at one time, $19.8 million belonged to the church but after the “anonymous gift to GFA,” that money belonged to the other entity controlled by Yohannan, GFA. Also, note that four of the six board members are Yohannan and his family (Siny Punnoose – niece; Sarah Johnson – daughter; Daniel Johnson – son-in-law). These documents along with the court papers filed by Believers’ Church paint a completely different picture than drawn out by Yohannan in the May 14 staff meeting. I invite GFA and/or Believers’ Church to submit evidence to the contrary. If BC’s Constitution has been changed or trust deeds have been amended, I will gladly publish those if they are supplied. Of late, Yohannan has been unavailable for comment. Perhaps, David Carroll or John Beers can provide explanation or proper documentation.